Noble Shepherd Craft Brewery is owned and operated by husband and wife; Tony and Jessica Moringello. Tony is originally from Penfield, New York where he is currently a chef for The Legacy. Jessica is originally from Phelps, New York and this is also where she teaches third grade for the Phelps-Clifton Springs Central School District since 2010. The horse farm Jessica grew up in Phelps; Terry Ho Stables currently is where her father Mark Case has been growing hops for the beers at Noble Shepherd. Head brewer, Tony has worked as the executive chef at The Legacy; a senior living community in Penfield, New York since 2009. Tony’s knowledge of ingredients and flavors that he cooks with at his job is where many of his inspirations for beer recipes often come from. Growing up in an Italian house, Tony’s parents also educated him in influential ingredients and cooking techniques which started his ability to be creative with flavor in many dishes at an early age. Tony has been home brewing since 2012. The idea to start Noble Shepherd Craft Brewery came from a cooking competition fundraiser for the Pirate Toy Fund that Tony participates in every spring. At one particular fundraiser in 2013, Tony was asked to create a dish representing ingredients from France. Using that as a guideline Tony created a champagne-infused beer to pair with his French food dish. The beer ended up being the hit of the competition and people were coming up asking where they could buy his beer and requesting to buy cases of it! Realizing the demand for his beer and his ability to create food and drink with unique flavors the idea to open a brewery began. The name Noble Shepherd comes from a special place in our lives. The “Noble” in Noble Shepherd represents the beer that Tony researched and was inspired to brew by; it is a beer made by Dog Fish Head Brewing Company name Noble Rot. This beer is created using grape must that comes from the grapes that fall off the vine and cannot be used to make the wine. Noble Rot is one of Tony and Jessica’s favorite brews to this day! The “Shepherd” part of the name is significant in that while living on Shepherd Street in the city of Rochester Tony and Jessica discovered our faith in God and following Jesus as their shepherd is what has lead them to this idea in the first place. Therefore, great beer paired with great faith led them to start Noble Shepherd! 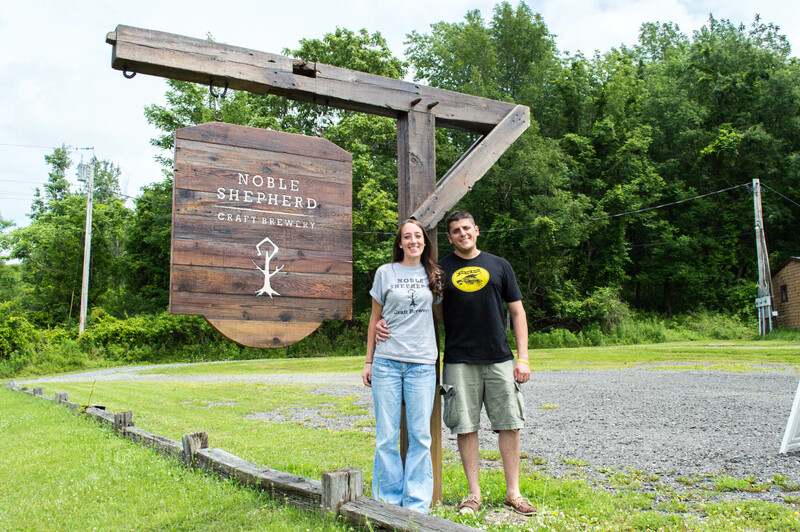 Noble Shepherd will be operated by Tony and Jessica, Tony will be brewing the beer and they will both be running the tasting room. The business would also not be possible without all the help they have received from their family. Their family and friends have been a huge help in the creation of this business and they are grateful for all the time and energy they have put in to make the brewery a success.